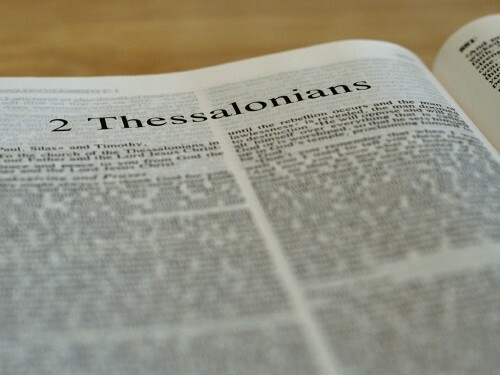 Seek To Know The Truth: IS THE RAPTURE IN 2 THESSALONIANS 2:3? I believe that there is a strong possibility that 2 Thessalonians 2:3 is speaking of the rapture. What do I mean? Some pretribulationists, like myself, think that the Greek noun apostasia, usually translated “apostasy,” is a reference to the rapture and should be translated “departure.” Thus, this passage would be saying that the day of the Lord will not come until the rapture comes before it. If apostasia is a reference to a physical departure, then 2 Thessalonians 2:3 is strong evidence for pretribulationism. The verb may mean to remove spatially. There is little reason then to deny that the noun can mean such a spatial removal or departure. Since the noun is used only one other time in the New Testament of apostasy from Moses (Acts 21:21), we can hardly conclude that its Biblical meaning is necessarily determined. The verb is used fifteen times in the New Testament. Of these fifteen, only three have anything to do with a departure from the faith (Luke 8;13; 1 Tim. 4:1; Heb 3:12). The word is used for departing from iniquity (2 Tim. 2:19), from ungodly men(1 Tim. 6:5), from the temple (Luke 2:27), from the body (2 Cor. 12:8), and from persons (Acts 12:10; Luke 4:13). The first seven English translations of apostasia all rendered the noun as either “departure” or “departing.” They are as follows: Wycliffe Bible (1384); Tyndale Bible (1526); Coverdale Bible (1535); Cranmer Bible (1539); Breeches Bible (1576); Beza Bible (1583); Geneva Bible (1608). This supports the notion that the word truly means “departure.” In fact, Jerome’s Latin translation known as the Vulgate from around the time of A.D. 400 renders apostasia with the “word discessio, meaning ‘departure.’” Why was the King James Version the first to depart from the established translation of “departure”? Remember, the Thessalonians had been led astray by the false teaching (2:2–3) that the Day of the Lord had already come. This was confusing because Paul offered great hope, in the first letter, of a departure to be with Christ and a rescue from god’s wrath. Now a letter purporting to be from Paul seems to say that they would first have to go through the Day of the Lord. Paul then clarified his prior teaching by emphasizing that they had no need to worry. They could again be comforted because the departure he had discussed in his first letter, and in his teaching while with them, was still the truth. The departure of Christians to be with Christ, and the subsequent revelation of the lawless one, Paul argues, is proof that the Day of the Lord had not begun as they had thought. This understanding of apostasia makes much more sense than the view that they are to be comforted (v. 2) because a defection from the faith must precede the Day of the Lord. The entire second chapter (as well as 1 Thessalonians 4:18; 5:11) serves to comfort (see vv. 2, 3, 17), supplied by a reassurance of Christ’s coming as taught in his first letter. I wonder if you have noticed the striking parallel between this verse and verses 7–8, a little further down. According to your suggestion verse 3 mentions the departure of the church as coming first, and then tells of the revealing of the man of sin. In verses 7 and 8 we find the identical sequence. Verse 7 tells of the removal of the Church; verse 8 says: “And then shall that Wicked be revealed.” Thus close examination of the passage shows an inner unity and coherence, if we take the word apostasia in its general sense of “departure,” while a superficial examination would easily lead to an erroneous interpretation as “falling away” because of the proximity of the mention of the man of sin.